If you hear ringing in your ears, get it checked out. Don’t let it drive you to distraction. Here, find possible causes and learn what you can do about tinnitus. Ringing in your ears, known as tinnitus, may not seem like a big deal. But for many, it’s an annoying condition that can drive you to distraction and affect your life. Thankfully, there are several ways to relieve the problem. It’s also a common complaint. Nearly 50 million Americans report some type of tinnitus, according to audiologist Craig Newman, PhD, Vice Chair and Section Head of Cleveland Clinic’s Allied Hearing, Speech and Balance Services. For about 42 million people, the problem is bothersome and/or chronic. Physicians and audiologists don’t always know the exact cause of tinnitus. Excessive noise exposure is a common cause. Do you work in a noisy environment, such as a factory or construction site? Or perhaps you listen to loud music constantly or use power tools? Exposure to loud sounds puts your ears at risk. Whether you’re young or old, it’s a good idea to take steps to protect your ears. To reduce your risk, physically remove yourself from loud sounds, turn down the volume or wear hearing protection. 1. Ear wax. Something as simple as a buildup of ear wax in your inner ear may cause your ears to ring. Your doctor can remove the wax to eliminate the ringing. 2. Medications. Some medicines may affect your ears. 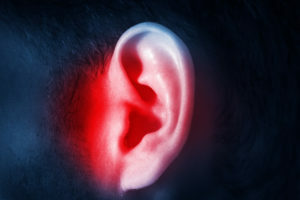 High doses of aspirin, certain antibiotics and antidepressants may cause tinnitus. Chemotherapy drugs also may affect your ears. Check with your primary care physician to determine if any medications you take could be a culprit. 3. Dental issues. Ringing ears sometimes may relate to a non-auditory problem with your jaw or teeth. For example, a temperomandibular joint (TMJ) disorder can cause noises like popping or clicking in the joint in your jaw. If you recently had dental work or your jaw is bothering you, you may want to revisit your dentist. Sometimes a night guard or a dental orthotic device can help with dental issues and stop the annoying sounds you’re hearing. 4. Head injuries. Were you in a motor vehicle accident recently? Or did you bump your head? If so, that ringing you hear may be a symptom of a biomechanical problem of the head, neck or jaw. If you have concerns after a head injury, seek medical attention. To help prevent a head injury, wear head protection if you play high-contact sports, such as hockey, or if you work at a high-risk location, such as a construction site, Dr. Newman advises. 5. Diseases. Ringing in your ears is sometimes a symptom of a medical condition, such as Meniere’s disease. This occurs when abnormal fluid pressure builds up in your inner ear. Hypertension and diabetes may cause tinnitus as well. It’s always best to get a medical check-up to find out what’s wrong. Unfortunately, there is no FDA-approved medication for tinnitus, Dr. Newman says. Treatment usually involves trial and error. Cognitive behavioral counseling can help you change your thinking or behavior to help manage tinnitus, Dr. Newman says. Sound therapy involves the use of external relief-producing sounds to help you change how you react to tinnitus. Some patients find relief at night with a bedside sound generator. There are even apps you can download for smartphones or tablets that may help. Hearing aids are the answer to tinnitus for some people. “You improve your ability to hear and the hearing aids amplify the sounds around you to mask the tinnitus,” Dr. Newman says. Some hearing aids have a built-in sound generator which produces white or pink noise, or ocean wave sounds. This provides masking relief and promotes a process called habituation (helping you get to a point where you no longer pay attention to the tinnitus). Don’t just wait and hope your tinnitus will go away. Talk to your primary care physician and audiolinogist if you notice ringing in your ears or other problems with your hearing. They can help you pinpoint your problem and find relief.